When it comes to writing about feminism people get as easily riled up as they would on the topics of religion or politics. I know this because I have written about female directors before on my old blog and it resulted in arguments both online and off. Now that I have had more practice in life and with writing online hopefully I can talk about these high hazard topics without waiting for the internet hate to role in. I feel as though I should be writing about topics such as this, encouraging discussion and not shying away from them. There are many factors that crop up when you try to find out why there are fewer female film directors, which makes the solution hard to establish. Personally I believe that the problem steeps from the historical subjugation of women, how girls are raised differently to boys and the lack of female role models in the film business. I don’t believe any of these problems can be changed quickly. My own experience as a filmmaker has been different. Personally I have never experienced sexism on a film set. 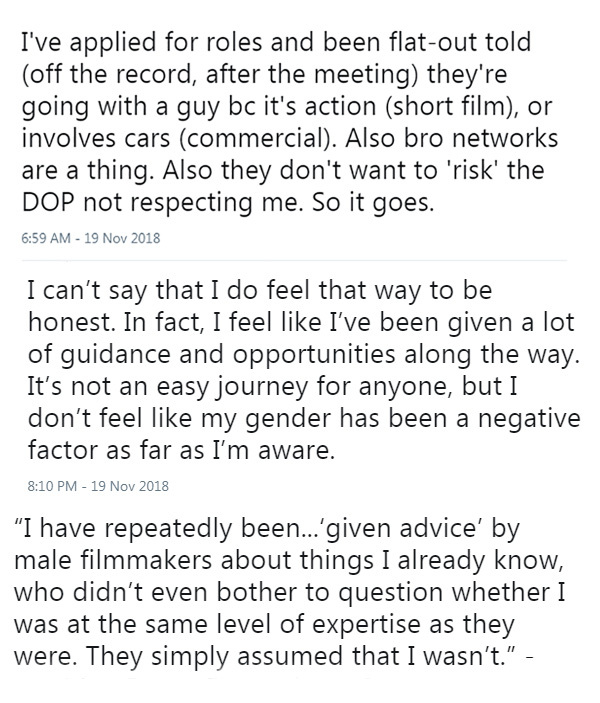 At least it is not something that I have seen close up and this may also be down to the fact that I worked within a job role typically done by a woman (Script / Continuity Supervisor). Female film directors have had both positive and negative experiences of working in film. Perhaps there are a few misogynistic people out there who still hold outdated view points on why women should not be in leadership job roles. Do As Many Women Want To Direct Films As Men Do? It is hard to provide a legitimate answer to this question. The UK study on female directors says that film production classes are taught equally to both men and women. This is something I find hard to believe, I would assume that more men are taught filmmaking in higher education. If we take the study as accurate that half of film students are female, we cant assume that every women in a film production class wishes to direct. Perhaps this is because the leadership role, the ballsy attitude a director is said to need, is not something that attracts most women. Perhaps women prefer to not lead, or this might stem from how most women are raised to be quieter than men, more humble and submissive. When you think film director and conjure up an image in your mind. It is almost always a man, perhaps with a cocky personality and aggressive determination. The genius director in film can be rude and condescending, these are unconventional personality traits for a woman to hold. If more women are to direct films, then not only does there need to be more female director role models but the image of what makes a great director needs to change. In my own 2009 Film Production class there was roughly 15 students and perhaps only 5 of them where women. I also understand that some of these women left film shortly after, because their desire to start a family young outweighed that of a film career. Working in film and having a family in your twenties is surely an impossible task. Do Women Quit Directing When They Have Children? Even in the most liberal of businesses if a woman takes time off work to raise children, her career will suffer. There are study’s which show that if both parents take the same amount of time off (during maternity and paternity leave) this can reduce the negative effect on a woman’s career. This is because some managers are reluctant to give women promotions because they assume at some point they will get pregnant and take more time off work. Back to the film industry where not only are jobs freelance, but work hours are very long (clocking 12-16 hours a day). If work hours where shorter on film sets this would no doubt be beneficial to both men and women. There is also talk of providing child care on film sets, which might not be a dubious proposal. I was recently pointed to the Mom’s In Film business and their Wee Wagon concept. I see no reason why major budget films can’t put money aside for cast and crew childcare. This might not be possible for indies but it is something to keep in mind for change in the future of film production. According to the UK study half of all government backed films should be directed by women. Personally I am against this idea, as it suggests a form of selective discrimination. Films should be funded on how well they are perceived to make a profit, how good the screenplay is amongst other factors. But I am against the idea of funding women directors to tick a diversity box.